On 22 March, 2016, the Centre for Scottish and Celtic Studies welcomed Alan Macquarrie to discuss ‘Roderick MacLean of Iona (d. 1553): a renaissance Humanist from the Western Isles’ for the Second Annual John Durkan Memorial Lecture. Dr. John Durkan was Senior Research Fellow in Scottish History at the University of Glasgow from 1976 until his passing in 2006. He specialised in religion, culture, and learning in the era of the Scottish Renaissance and Reformation. Below is this listener’s brief summary of the lecture. Alan Macquarrie began by relating that the scholar and poet Roderick MacLean of Iona fell within Dr. John Durkan’s many research interests. Durkan’s essay on the cultural background of 16th century Scotland incorporated some of MacLean’s poetry, although he never found time to follow up on this figure. We now know a great deal more about this historical figure due to the combined efforts of Mark Dilworth, Richard Sharpe, and Roger Green. 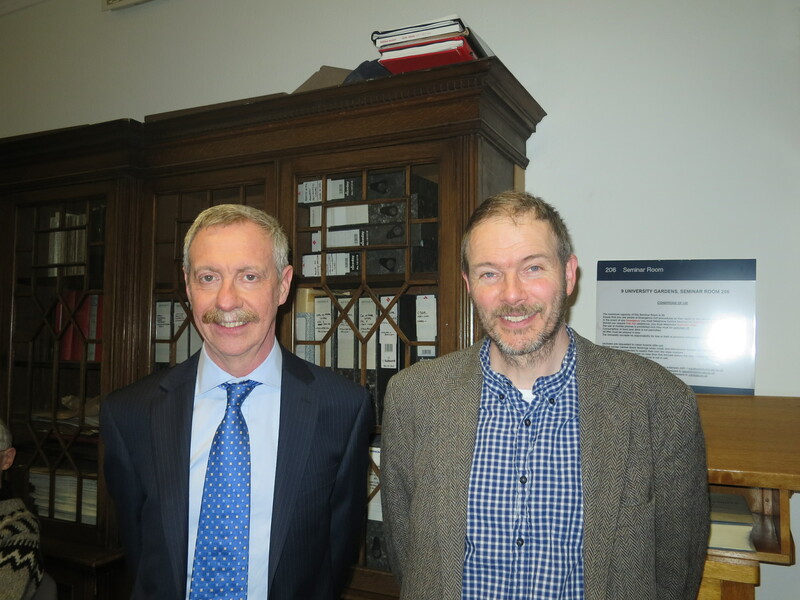 Dr. Alan Macquarrie with Dr. Martin MacGregor after the Second Annual John Durkan Memorial Lecture. In 1544, his brother sought to resign his bishopric in favour of Roderick. However, political tensions between the rebels in the Western Isles and the governor led to difficulties in his appointment. In 1547, in order to placate the rebels, the governor gave Patrick MacLean, brother of MacLean of Duart, the temporary position. Soon after, Roderick was summoned to Iona Abbey over a set of goods belonging to the Abbey in front of the Commissary of St. Andrews; when he failed to appear, he was removed and (perhaps) excommunicated. He wrote many letters attempting to gain support for his legal battle for the Bishopric and Commendatorship, and was finally granted the position in 1549. After a brief delay due to the death and election of a new Pope, in 1550 Roderick was named the “Elect of the Isles,” and was finally consecrated as the Bishop of the Isles in 1552. Unfortunately, he passed away shortly thereafter in 1553. The poetry for which MacLean is the most well known is entitled “Book of the Song of Iona,” also referred to as the Ionis, which was published in Rome in 1549. It is a paraphrase of Neo-Classical Latin verse of selected chapters from Books One and Two of Adomnán’s Vita Columbae. His text only survives in a rare book of which there are only two known copies, one in Aberdeen University Library and one in the Biblioteca Comunale Augusta in Perugia, Italy. Roderick was clearly talented in the use of both the Gaelic and Latin languages, as he elegantly Classicised many of Adomnán’s spellings of the Gaelic placenames in his writing. He was also skilled in poetic metre, of which he used various styles in the Ionis. He was evidently influenced by the format of Horace’s Odes, and he used Sapphic stanzas, Iambic metre, and elegiac metre, among others. The written source he referred to for the Ionis is Adomnán’s Vita Columbae, which survives in two manuscript traditions today; these are now referred to as Manuscript A (also known as the Schaffhausen/Dorbenne Codex) and Manuscript B (a group of three Late Medieval texts). By comparing MacLean’s use of proper names in the Ionis to those in the two manuscripts, Macquarrie determined that it was most likely that MacLean’s copy of Vita Columbae was more closely related to the Manuscript A, and suggested that MacLean would have had his own copy of this Manuscript A in Scotland. Alan concluded his talk by stating that Roderick MacLean greatly resembled a 16th century Adomnán, who respected the traditions of the Catholic church, especially the traditions of Iona, but was also open to new evangelical concepts; he was widely travelled and well-learned in both Latin and Gaelic. He admired the qualities he found in Saint Columba as he was described in the sources and considered the saint an example to be followed and admired. Live and flourish, seat of piety, so that all your holy churches, relics, tombs and crosses may endure for ever. This marks the end of our Spring 2016 Seminar series, many thanks to all who attended! A new seminar series will begin next semester. Please keep an eye on our Twitter and Facebook feeds for future updates.